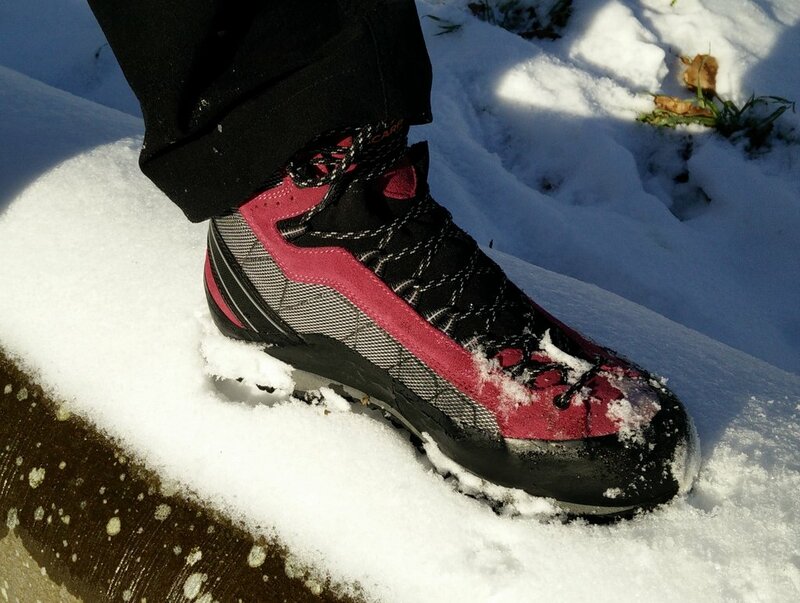 This entry was posted in Gear Tests and tagged hiking boots mountaineering boots outdry scarpa scrambling boots via ferrata boots on January 21, 2019 by Laura P.
In January 2017 I decided that it was finally time for me to get a pair of proper hiking boots and I ended up purchasing a pair of Scarpa Marmolada Trek hiking boots. 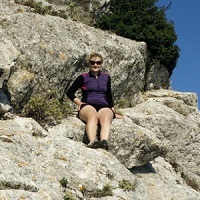 I tested them on the Bodenhaus-Ammererhof and Grubereck trails in the Austrian Alps and on minor hikes since then and this is what I have learned. Scarpa has since its inception in 1938 (the name stands for Societa Calzaturiera Asolana Riunita Pedemontana Anonima – meaning the Associated Shoe Manufacturing Company of the Asolo Mountain Area) had a focus on high-quality craftsmanship and later on innovation as the brand catered to the rapidly developing mountaineering and climbing culture in northern Italy from the 1960’s onward. The Scarpa Marmolada boots (named after the highest peak in the Dolomites) are indeed the result of both craftsmanship and innovation as they were designed with demanding terrain in mind while still being as light as possible, which requires thoughtful and innovative material choices. Starting with the outside of the boots, the uppers are made of a combination of 1.8 millimeters waterproof suede, synthetic S-tech material (waterproof and durable as leather, but much lighter) and Schoeller L-tech material (light yet extremely tough) while being protected by a full rubber rand. Due to the greater part of textile on the uppers, they are less durable than various types of leather uppers (full-grain, split-grain, nubuck suede etc.) but also much lighter and breathable. The flex area of the boots (the front side of ankles) has a Flex Point design which allows the natural ankle variation between foot and leg during walking. The tongue and flex area are constructed in a single piece which among other things enhances the water-resistance of the boots. In terms of shape, the Scarpa Marmolada is built around the so-called BQ last which is quite broad across the forefoot and designed with trekking in mind. The sole of the Scarpa Marmolada is the Mulaz S which combines a die cut EVA (ethylene vinyl acetate) shock absorbing midsole of differentiated thickness with a Vibram rubber outsole with deep lugs to provide differentiated areas of thrust, braking and maximum grip. The lining consists of Cocona 37.5 fabric and the highly breathable and waterproof OutDry lining laminated to the inside of the boot. The Pro insole is made of polypropylene and fiberglass with an upper coating of felt and a lower coating with compressed felt. 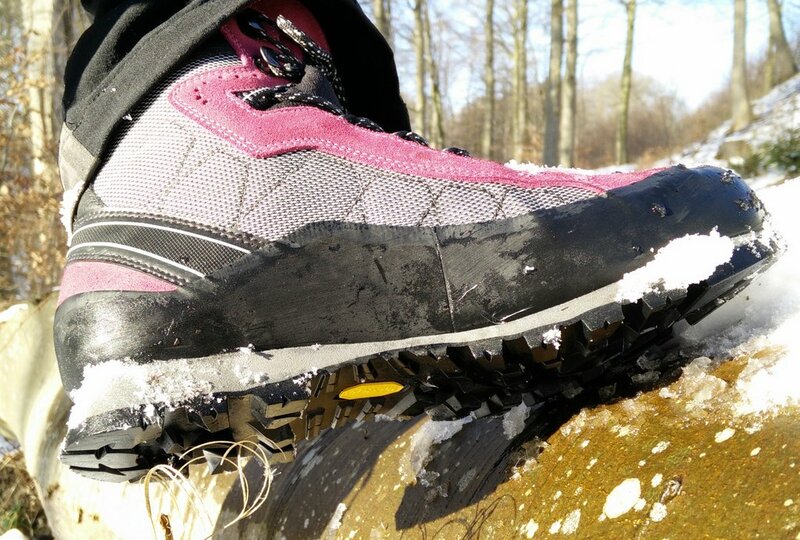 If you want to know more about the qualities and characteristics of various hiking footwear materials, please check out our Hiking Footwear Guide. 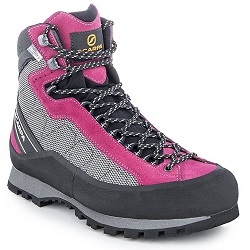 The Scarpa Marmolada Trek boots are made both for women and men, with the only difference being sizing (sizes 36-42 + half sizes for women; size 41-47+ half sizes for men) and the color of the suede reinforcements on the uppers (women: pink or baby blue; men: red or lime green). Before buying the Scarpa boots, I had been wearing a pair of not-so-high-quality hiking boots which were the opposite of waterproof and had very soft and flexible soles – almost like trekking shoes. While these boots had been comfortable to wear hiking across meadows and grassy stretches, they were inadequate whenever the terrain became rocky. When I wore the Scarpa Marmolada boots for the first time, I was first a bit taken aback by the stiffness of the soles but as soon as we reached rocky terrain it was clear that the grip and performance of the soles is impeccable. 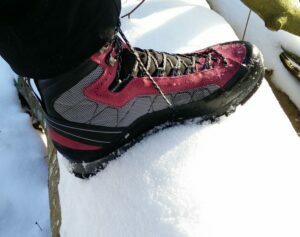 Although the boots were just out of the box, I didn’t need any time to “break them in” as they felt comfortable from the very beginning – possibly due to the up-to-the-toe lacing system (also known as climbing lacing) that ensures great fit and comfort. 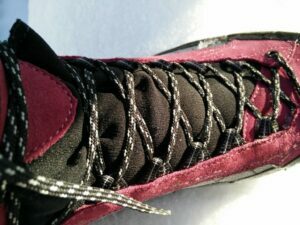 This type of lacing also gives a more precise feel when scrambling or doing Via ferrata trails, where foothold is crucial. In terms of sizing, it is a big advantage that Scarpa produces half sizes in addition to the normal ones and for me, a 39½ (≈ medium US8) was exactly right. As mentioned above, I primarily tested the Scarpa boots in the Austrian Alps. Here I especially noticed how well the Mulaz S soles performed on rocky terrain along with the superb ankle support. Whenever scrambling, the climbing lacing gave me a more precise feel. 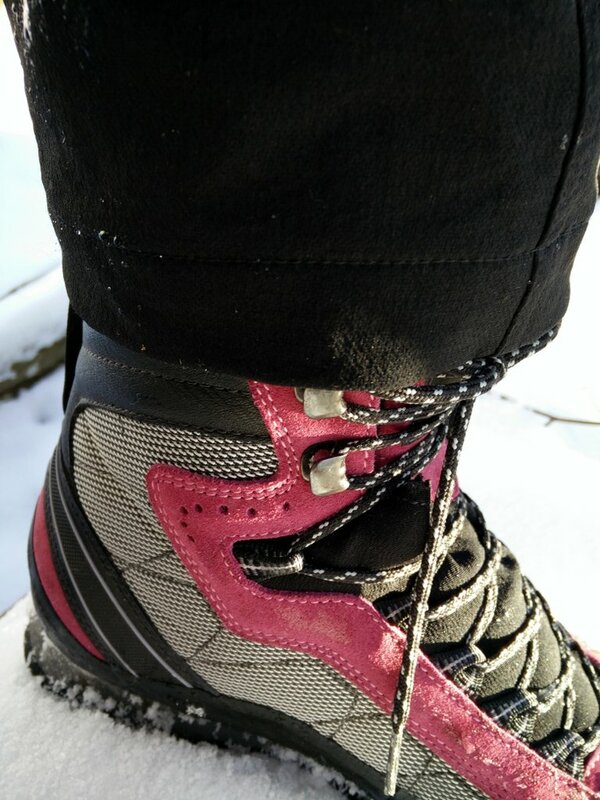 I can literally not say anything bad about the boots when it comes to hilly or rocky terrain. 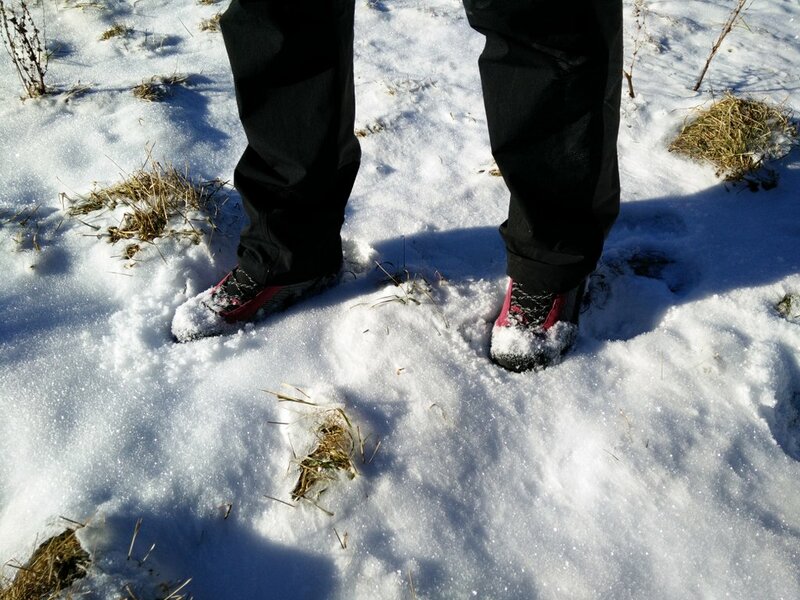 However, as to be expected, the stiff sole and semi-rigid ankle support, which make the boots excellent for more difficult terrain, make them less suitable for hiking over flat grassy areas where they in the long run feel stiff, heavy and clumsy. Besides the high-performance soles, the great advantage of the Scarpa Marmolada boots is the OutDry lining which not only keeps your feet dry in terms of keeping water out, but also by being so breathable that the perspiration from your feet will not soak your socks or boots and thus keeping your feet dry and comfortable – whether summer or winter. If you have any questions about this product, please drop me a line in the comments below.